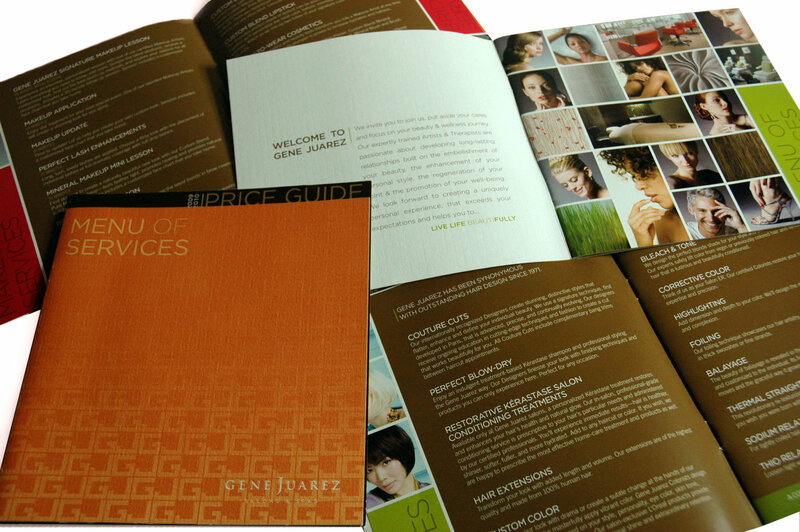 Gene Juarez Salons & Spas Service Menu 2010. 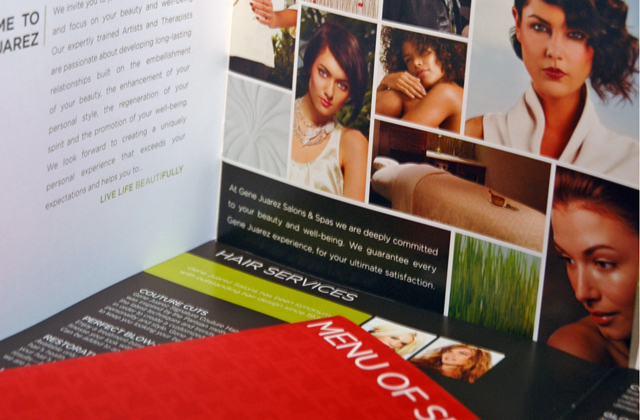 - Gene Juarez Salons & Spas Service Menu 2010. 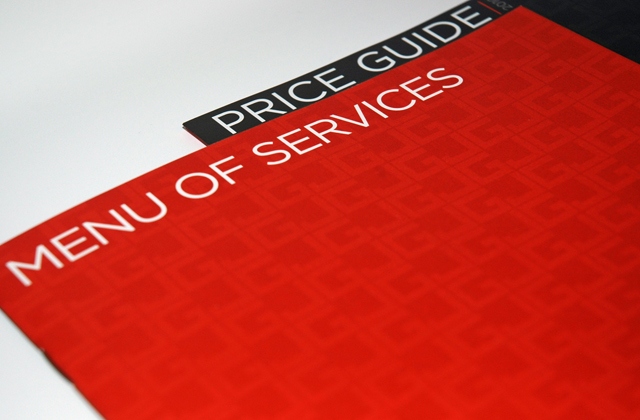 The cover features a linen textured paper and structured GJ pattern. The logo and title is foil stamped in white. 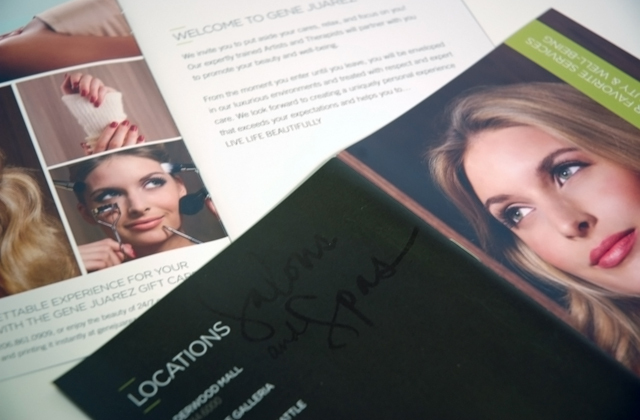 Gene Juarez Salons & Spas Service Menu for 2010. 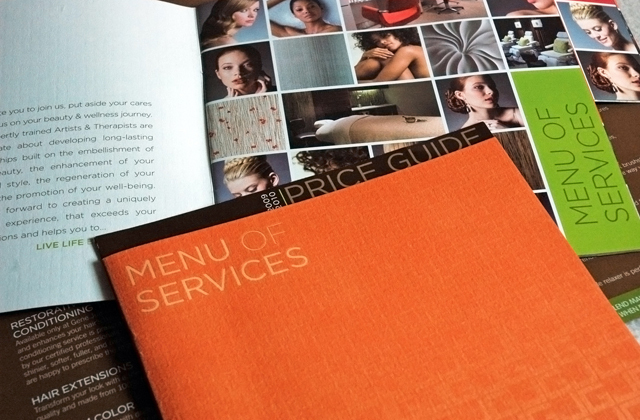 Each section is color coded on the right side of the pages for ease of finding different types of services. 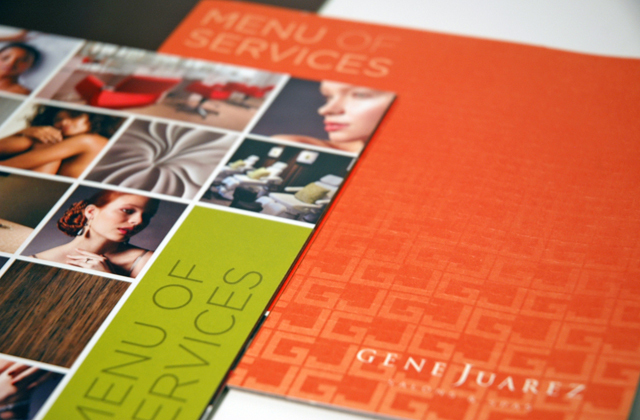 Gene Juarez Salons & Spas Service Menu 2010. 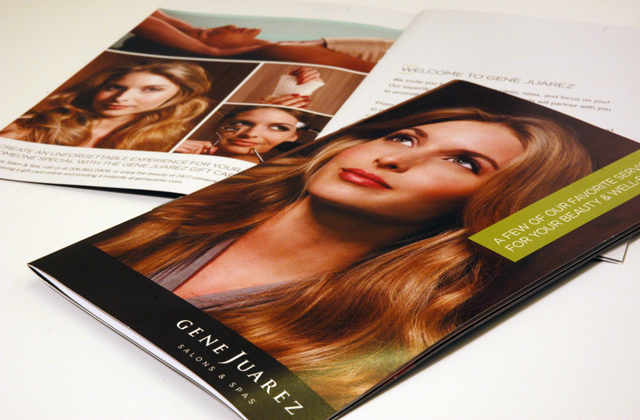 Gene Juarez Spring Event brochure - Double sided Z-fold brochure to announce the Gene Juarez Team Artistic Spring Event 2008. 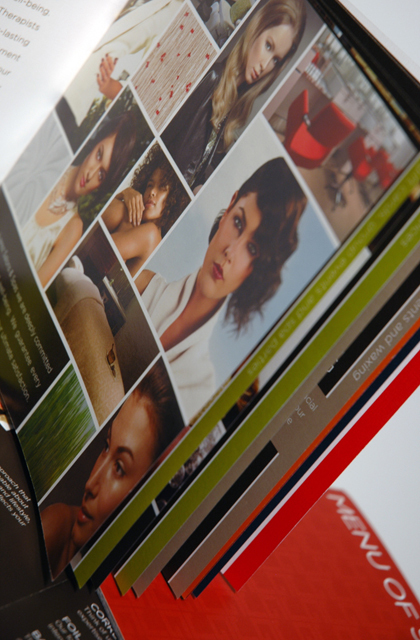 Front cover features the basic information and a portion of a face which then opens out to reveal the rest of the face and more of the fashions and hair trends for Spring 2008. 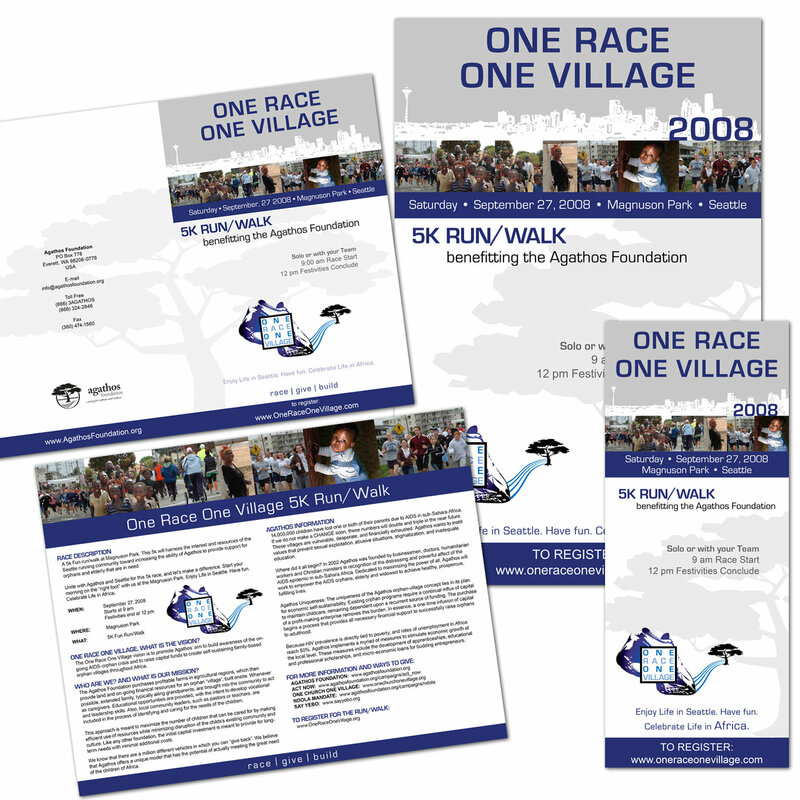 Back side features the event details in a creative and inspirational layout to inspire those attending to get excited for the upcoming season. 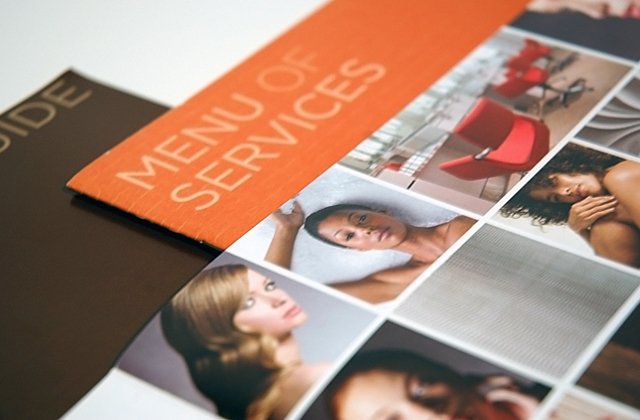 Four color, printed on 100# Centura White Cover. 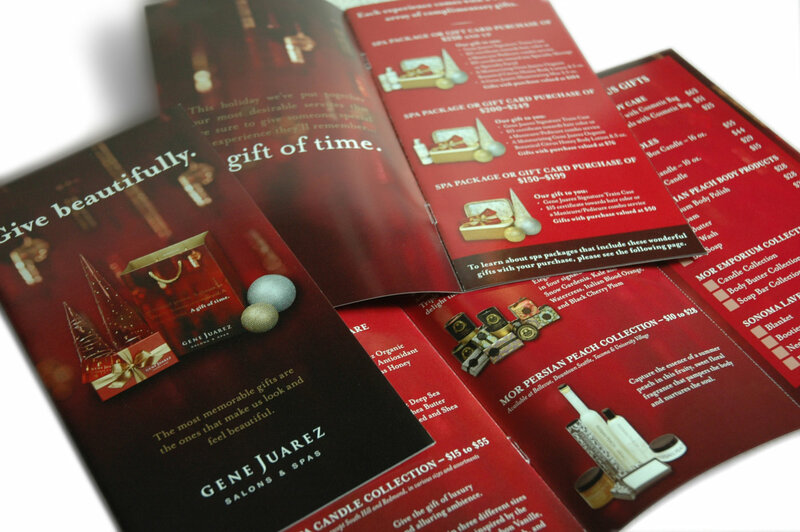 Printed by Printco Inc.
Gene Juarez Holiday Gift Guide 2007 - Photos all taken in-house by myself. 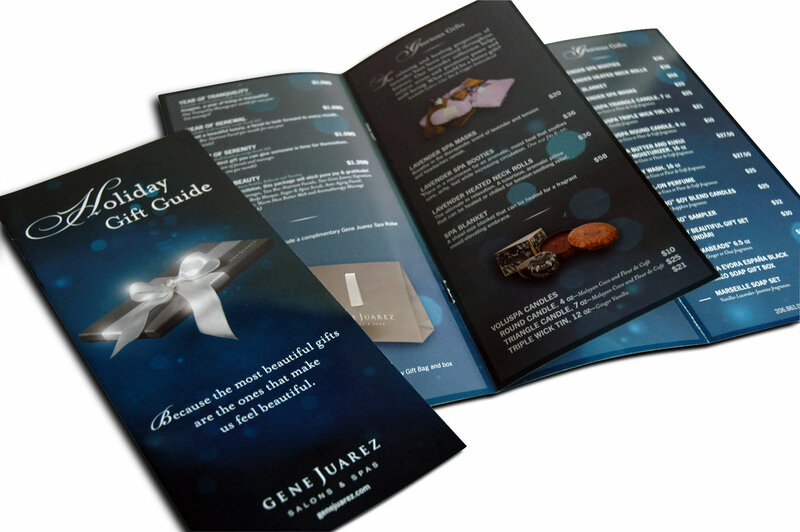 Printed on Centura 100lb cover and 80lb text by Printco Inc. Includes a perforated wishlist to share with loved ones. 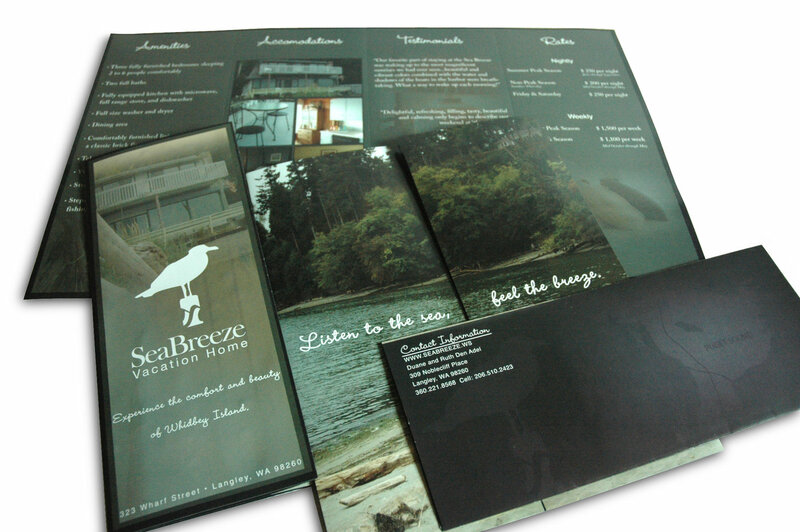 Sea Breeze Vacation Home brochure - Gatefold brochure. 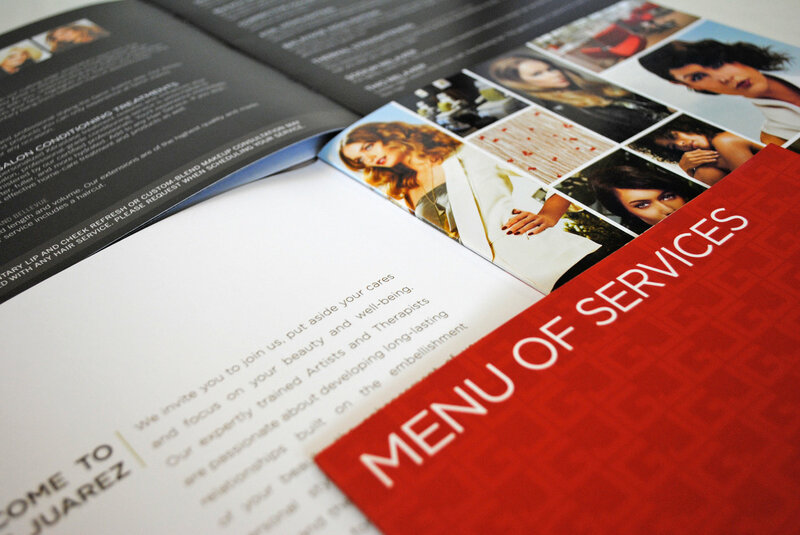 Printed on Centura Gloss by Print NW. Gene Juarez Holiday Gift Guide 2008 - Photos all taken in-house by myself. 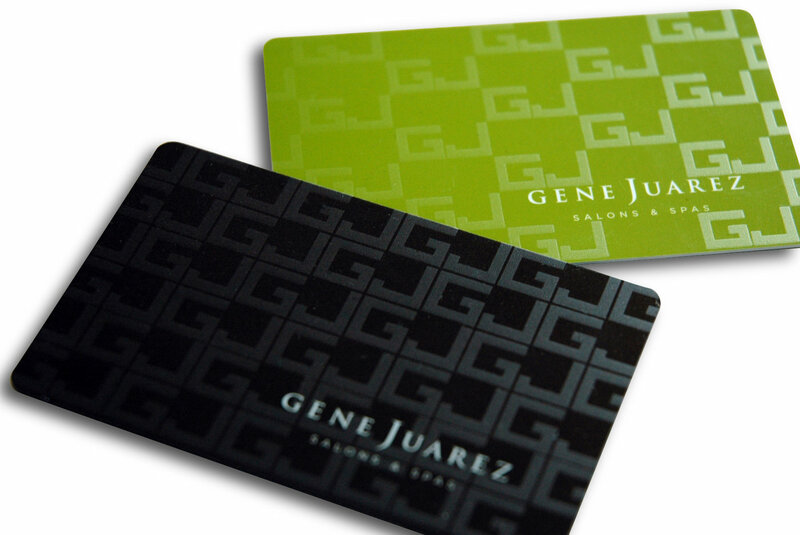 Gene Juarez Gift Cards - Two branded gift cards both printed on gloss vinyl gift card stock with a matte UV finish printed on the top surface to create a subtle GJ finish. 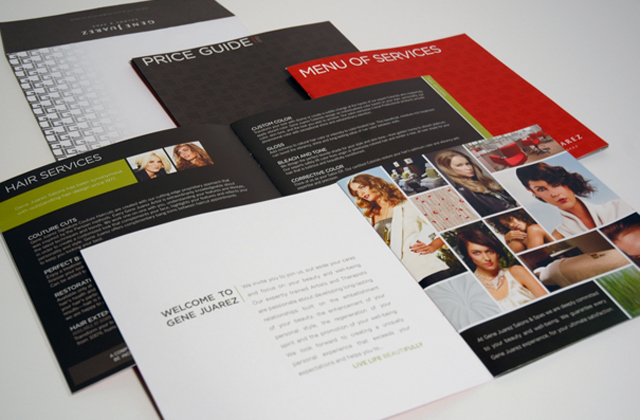 Gene Juarez Salons & Spas Service Menu 2009 - Gene Juarez Salons & Spas Service Menu 2009. The cover features Eames Architecture Paper to help play off of the grid of images and structured GJ pattern. The logo is foil stamped in white. The interior features many of the brand style images enhanced by a flood spot gloss or a spot gloss GJ pattern. 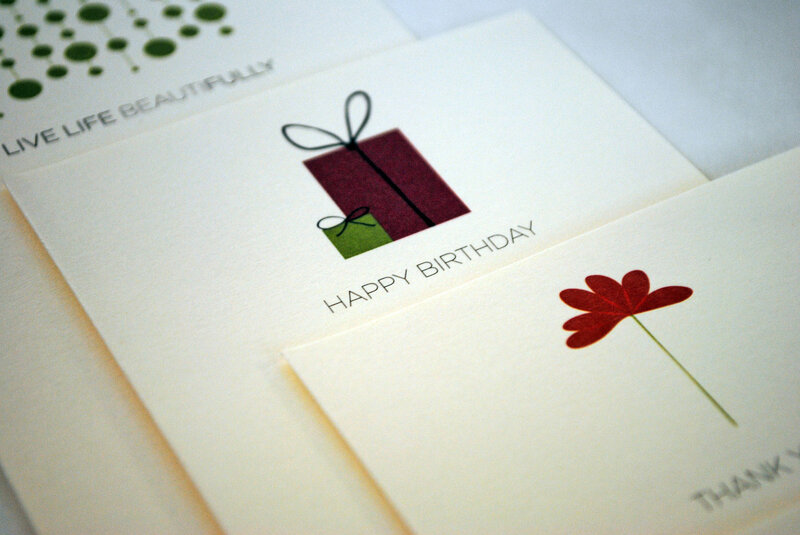 All occasion greeting cards - All occasion greeting cards design for Gene Juarez Salons & Spas to accompany the all occasion gift cards. 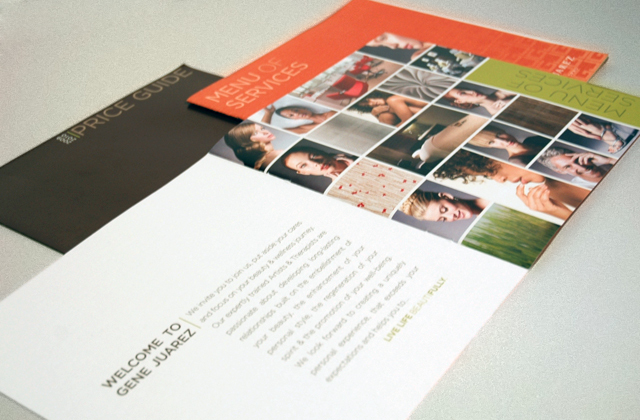 Gene Juarez Mini Service Menu - Gene Juarez Salons & Spas Mini Service Menu. 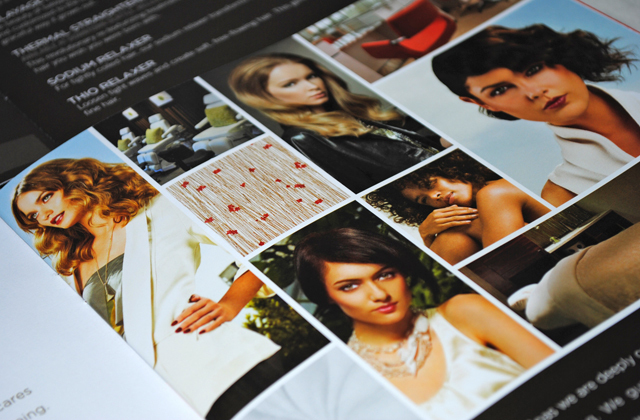 The interior features many of the brand style images enhanced by a flood spot gloss. 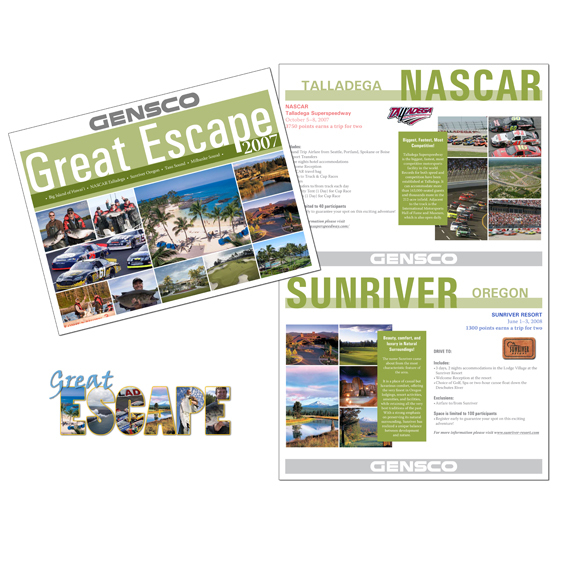 Gensco Great Escape informational booklet - Informational booklet to let customers know about the upcoming trips that they could schedule using points from purchases. Also designed logo using photos from the different trips. 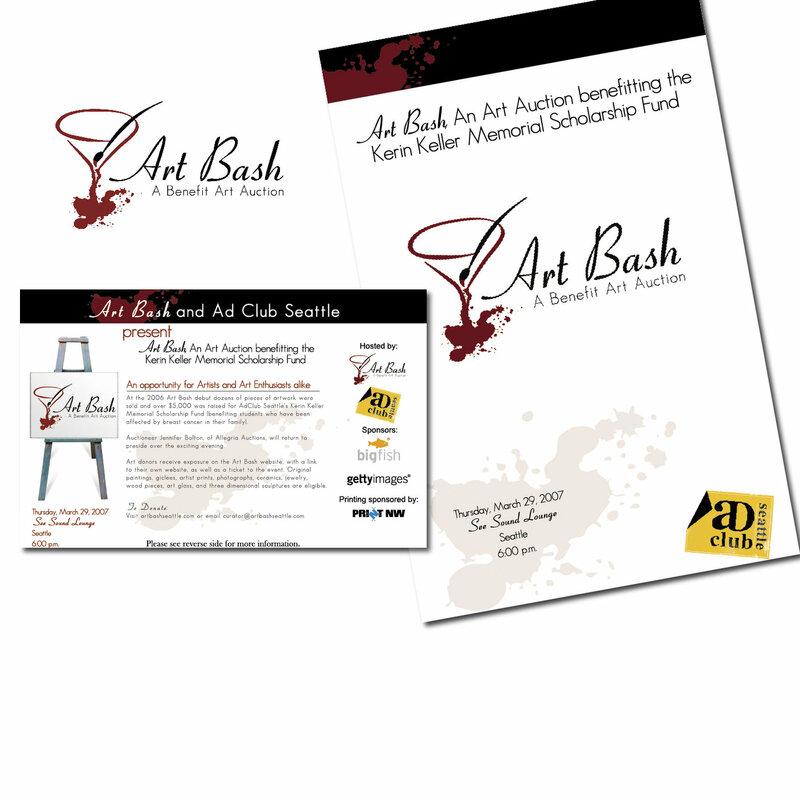 Art Bash Auction materials - Designed logo to incorporate the party atmosphere along with the tie in to the art that would be sold at the auction. 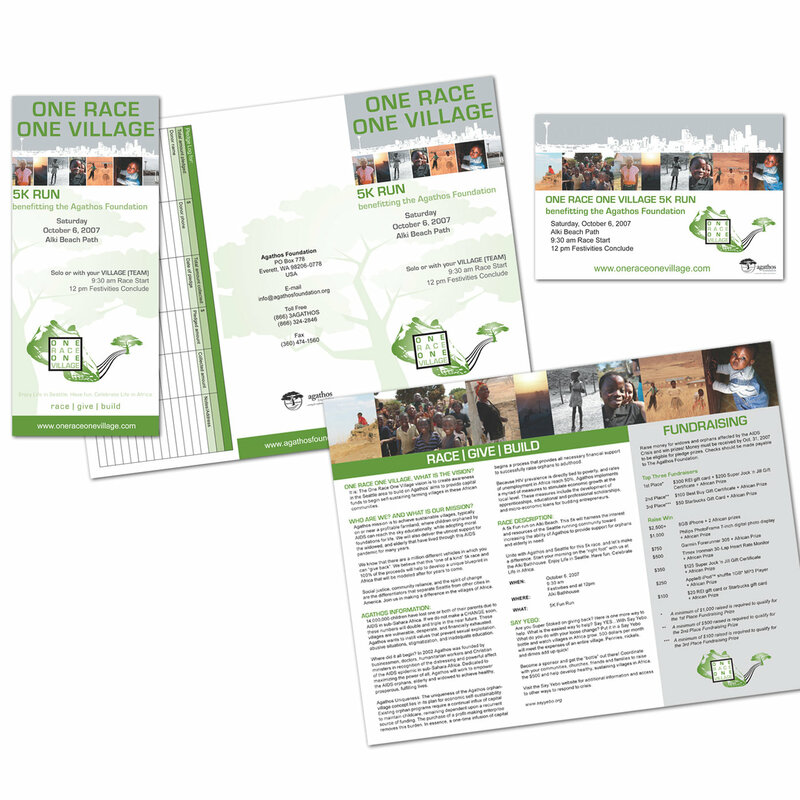 Also created a brochure, poster, postcard and other auction materials for the event.